A legal memo is a paper/document that contains information collected while researching and analyzing a particular subject/case. It follows a unique Patten for structuring the information. Legal memos have various types and there is no similarity in any two legal memos. The heading, facts, issues, conclusion, and analysis are the key elements of a sample legal memo.You can learn an effective way of writing legal memo by referencing our Professional Memo Samples. Download the memo documents and learn writing various kinds of memo letters. Interoffice legal demo PDF document is a ready-to-print document. Take a print and perform customization. It contains brief input fields to be filled by an employee and an undertaking column for signature. You can either use it by taking a print or can customize using digital software for editing undertaking and attachment notes. 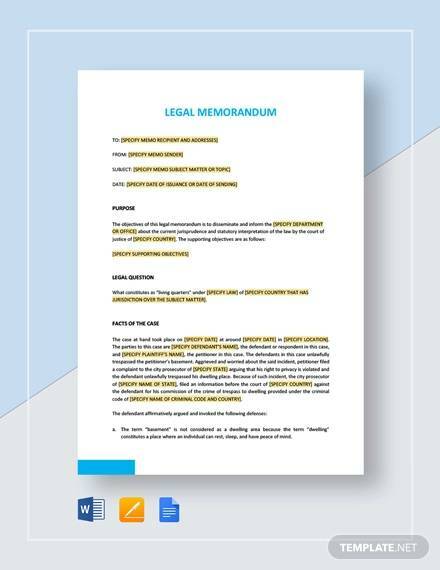 Download internal legal memo document and get access to sample memo letter. 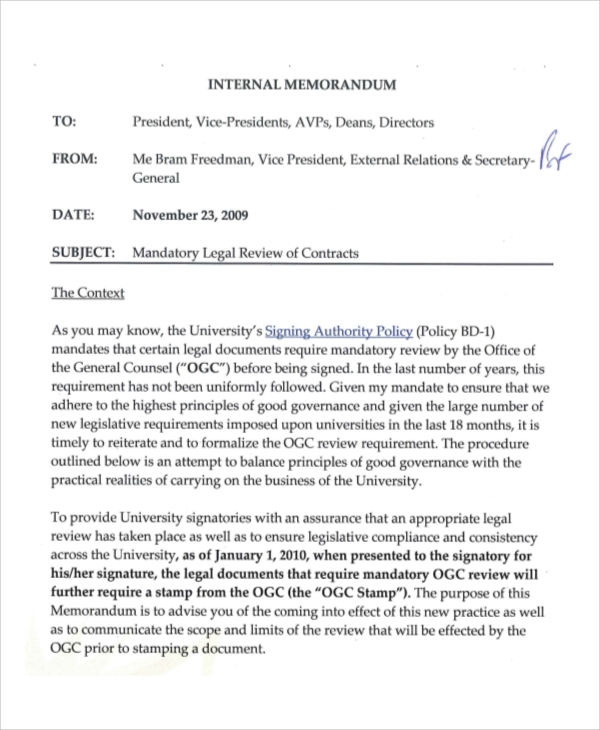 Internal legal memos are used for communication with higher authorities. Check the presentation, format, and copywriting language stuff to learn a keen and impressive way of writing an internal legal memo. 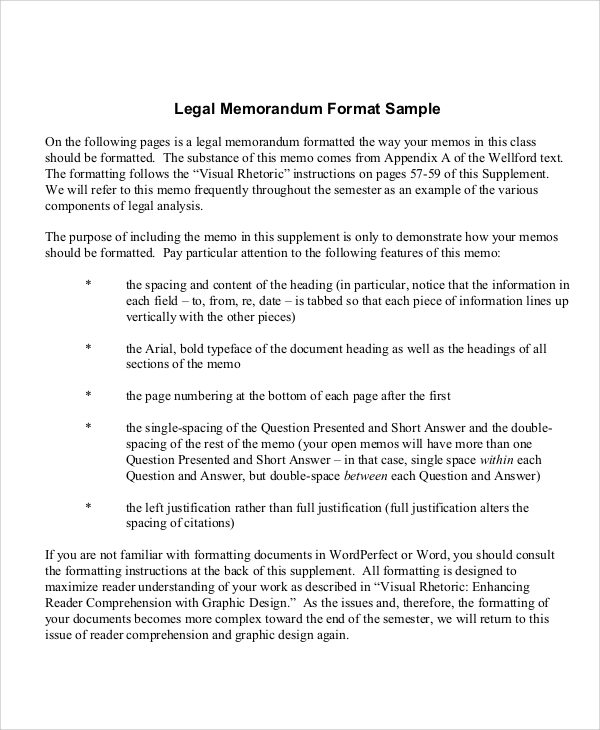 Formal legal memo PDF is a guide that explains how to write the formal legal memorandum. It includes a brief description of memo elements indicating both optional and compulsory elements. How to Write a Good Legal Memo? Before writing a legal memo, always think of your audience. Think about the purpose of writing the memo and where you are going to use it. Are you preparing it for a meeting or are you going to use it in the hearing? This will clear your idea of writing a legal Memo Sample. Once you have mapped the scene, then you will definitely write an effective memo. Check whether the memo is a reply to a conversation or question or an in-depth analysis. Always ask the client for a deadline to work on. So, you can schedule your ongoing assignments and organize things easily. 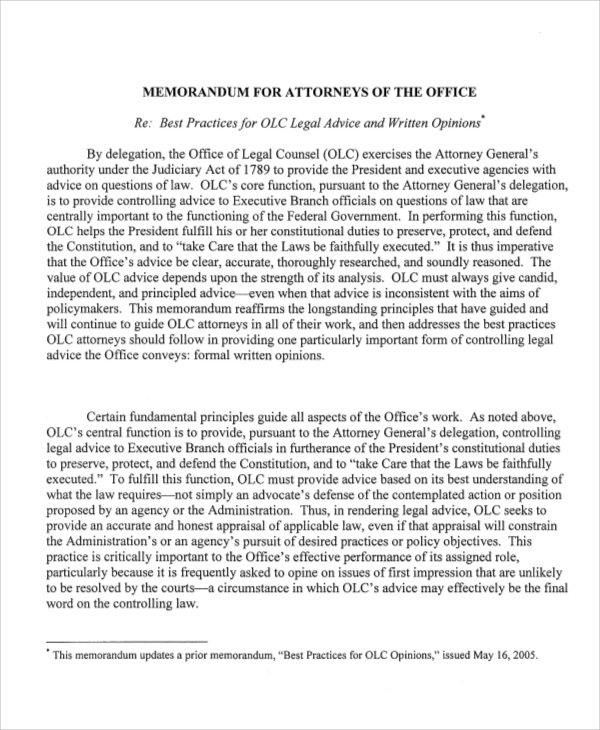 What does a Legal Memo Look Like? 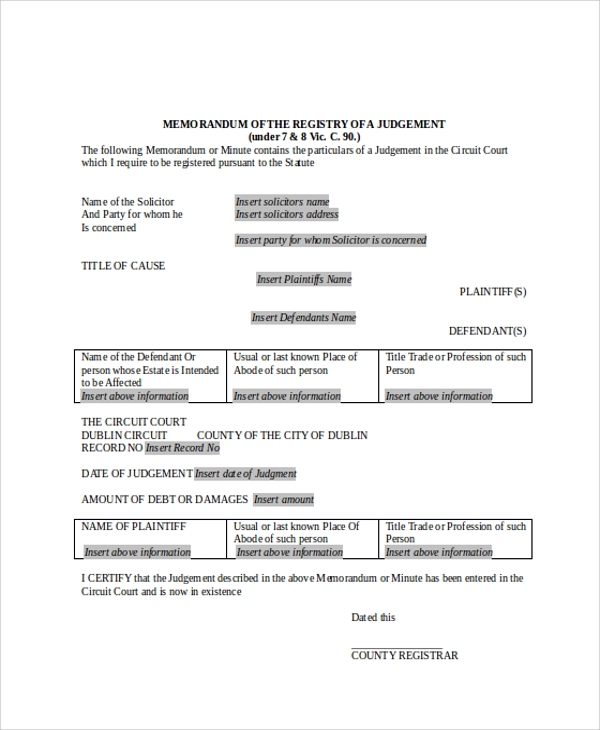 A legal memo looks like a business document having a formal structure. It contains recipient’s details, sender’s details, date, introduction, body, conclusion, and signature of the authority. Legal memo creation is cheap and inexpensive. 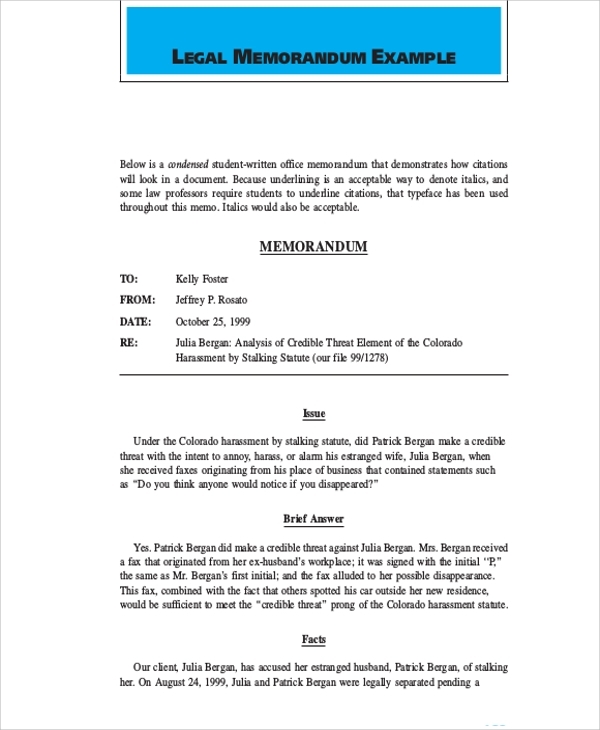 Legal memo involves a low risk of disputes than oral communication. 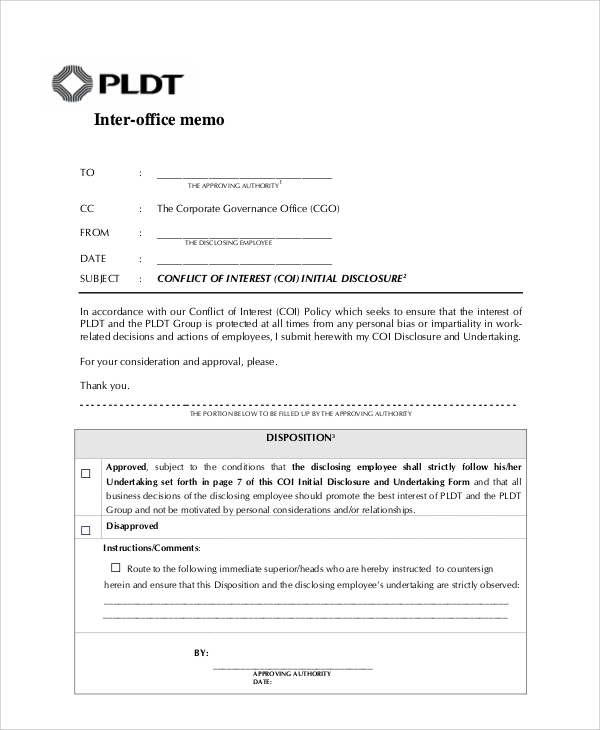 Memo serves as evidence and businesses use it as a reference for solving both internal and external disputes. Easy delivery and effective communication make it more convenient. 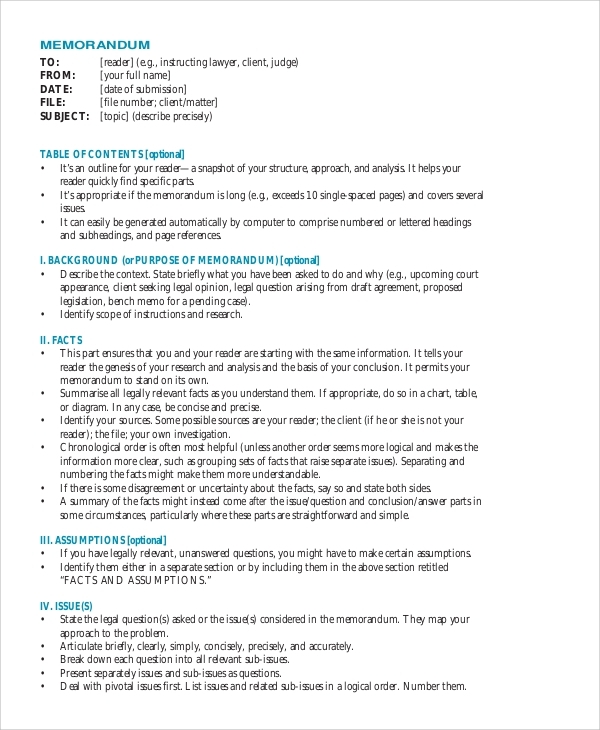 Our Business Memo templates are unique stuff that showers valuable information on writing clear and formal legal memo. Do read them and get benefitted.